BOSSY BETTY: Rooster In The Yard. Part One of the Betty vs Rooster Trilogy..
Rooster In The Yard. Part One of the Betty vs Rooster Trilogy.. I grew up in a family in which seeking attention was akin to worshipping the devil. While my parents made it seem as though this philosophy was based on a Biblical principle, I now see that it was also an awfully handy device for delaying any action on many issues. The strutting town sheriff of the barn yard, cool and self-assured in his glossy feathers of red and black was scared of me, the little, spindly, stringy-haired blond girl whose knees knocked together each time he spotted her. If you have never been singled out and chased by a rooster, you have no idea how harrowing it can be. When I stepped out of the house alone, he’d stop moving immediately. Then, only the long periscope of a neck would activate, lifting out of a ring of feathers, turning, turning, until his deep yellow eyes locked onto mine. As I slowly put one foot in front of the other, he brought up a low rooster growl, which sounded like a squeaky door being gradually opened. Then he’d slowly pick up his scaly feet and walk towards me. I’d walk faster and he’d match my pace. Soon, I’d be at a dead run, and hear his claws slapping down, like mad flyswatters in the dirt behind me. I’d scramble up a tree or on a stack of hay bales to wait for someone else to appear. When someone else DID appear, that rooster would play it cool, go into innocent poultry mode. He'd pretend he was just in the area, hanging around. He had no idea what the screaming blond girl was up to. “Kick him,” one of my sisters suggested, “Just stay out of his way,” said another. I liked the first suggestion, but dismissed it immediately. This rooster was bent on my destruction. To turn and face those fiery eyes, that determination was unimaginable to me. In my mind, that rooster was ten feet tall. So I decided to follow the second piece of advice. It wasn’t easy. He seemed to be everywhere on the farm and he was always on the lookout for me. One of my chores was to gather the eggs out of the chicken house—a dark, squat, dank, foul-smelling shack. Before the rooster’s reign of terror, I would go in, shoo the skittish chickens and then gather their eggs. However, I became so terrified of the rooster following me into the hen house as I collected his future progeny that once I got in, I shut the door immediately, trapping myself with 20 or so squawking, suspicious, desperate chickens. I squinted my eyes and bent down low, making my way to the individual nests. Walking though them, those flapping, swooping, high-pitched, feathered industrial fans set on high was a horrible routine. Even today, a down comforter shaken too vigorously will produce flashbacks that will require hours from which to recover. Tomorrow: The story continues and Betty gets all metaphorical and stuff too! i have actually been chased by a rooster, so i know your terror, truly. 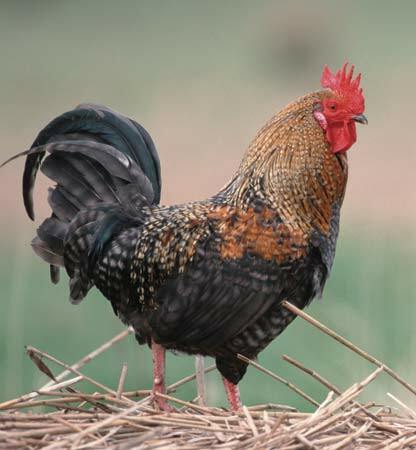 did your rooster have a name? ours was sigfreid. the hen was brunhilda. i tried to knock a chunk out of the liberty bell for you, but that didn't work, so i tried to tear a part of the dec of ind, again, not successful, and i think my photo is now being circulated as one of philly's most wanted.